Just shy of 50 years after the Apollo 11 mission successfully put man on the moon, it remains a landmark in mankind’s ingenuity. “First Man,” the latest film from Academy Award-winning director Chazelle, focuses a great deal on one of America’s largest cosmic accomplishments. However, there is an equal, if not greater, focus placed on the unmistakably human aspect of the mission. This comes in the form of the titular “First Man,” Neil Armstrong (Ryan Gosling), and his wife Janet Armstrong (Claire Foy). In doing so, Chazelle manages to make his film stand out among similar films, like “Apollo 13,” which capture the risks, thrills and monumental efforts of space travel, but do little to flesh out their characters. However, this choice may be highly disappointing to some viewers who bought their tickets expecting to get the grand, historical space epic advertised and instead get more of a slow-moving, emotional family drama/character study interspersed with scenes of space travel. Those who have avoided the film because of the absence of the planting of the flag need not worry. While it is true this action is not explicitly shown, the film cannot be called unpatriotic by any reasonable viewer. The scene of the moonwalk is the emotional payoff of Neil’s character arc—an incredibly personal moment. Neil plants his own personal flag of sorts on the moon’s surface. It emphasizes the mission was his own individual achievement as much as it was for the U.S.
“First Man” is simultaneously out of this world and down to Earth. “First Man” is simultaneously out of this world and down to Earth. These seemingly conflicting aspects are masterfully melded by screenwriter Josh Singer. This is even more impressive considering Singer’s diligent adherence to input given by NASA, historians and those who personally knew Neil. Singer does employ creative licenses with the story—most notably in the film’s most memorable moment—but he does not veer into the realm of outright fabrication. Though Chazelle and Singer are largely to thank for the brilliance of “First Man,” the excellent work done by everyone involved makes an already great film unforgettable. The acting, for instance, is extraordinary—the best so far this year. Gosling gives the greatest performance of his career as the highly emotionally guarded Neil. He is thoroughly consumed by grief following his young daughter’s death at the beginning of the film, but he does not dare openly express these feelings—not even with his wife. In one of the movie’s most devastating moments, and there are more than a few, Neil calmly leaves his daughter’s funeral reception, finds an empty room and, once he is certain no one is nearby, begins to weep. Though this is the only time Neil is shown expressing his grief, Gosling portrays him as stoic but on the verge of another such breakdown—barely able to keep up his facade. As Janet Armstrong, Foy continues to prove herself as one of the best actresses working today. She is a constant support to her husband and his career. She married him for a normal life but ended up getting the opposite. Janet is the one who pushes Neil to be more outgoing socially and, while she does not attempt to hide her emotions as Neil does, she does not have anyone to talk to about how she feels. Anyone familiar with Chazelle’s previous work (“Whiplash” and “La La Land”) knows the crucial role music plays in his films. 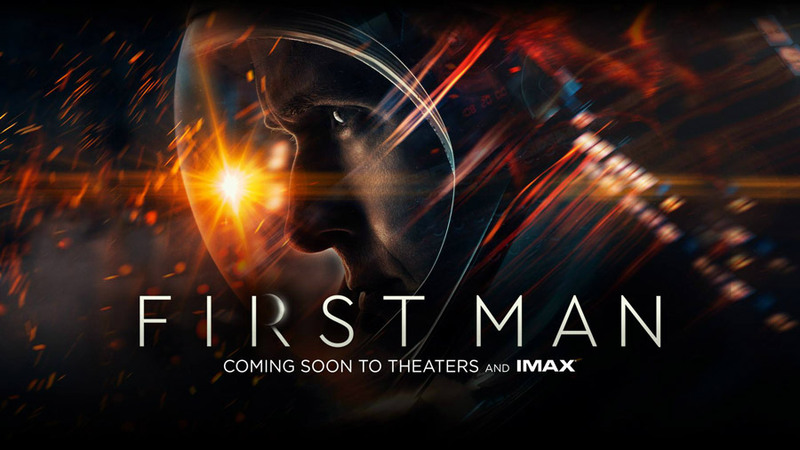 In fact, “First Man” is the first time in his filmography where at least one of the central characters is not a jazz musician. This may mean composer Justin Hurwitz, Chazelle’s former college roommate and collaborator on each of his films has less to do, but what music he does supply for the film’s score is still very much appreciated. Last, but not least, the film has wonderful special effects. There are several scenes where it is clear what is happening on screen is real. In one scene, an aircraft crashes and the man inside ejects himself and parachutes down to the ground. This was actually staged by the production instead of using CGI. Moments such as this add to the realism of the film without making it feel too grandiose. “First Man” may not be as good as Chazelle’s previous work, but it nonetheless displays his versatility as a director. As the legendary quote goes: “That’s one small step for man, one giant leap for mankind.” When the climax of the film comes and Gosling’s Armstrong echoes those eternal words of human achievement, the audience knows this “small step” is anything but.